With its red sloping one-piece tank-seat unit, the Montesa Cota seems to me the best looking of all trials bikes during the 1970s; the golden age of off-road motorcycle sport (according to some). Although the shape of the tank-seat unit was changed over the years, it remained a single piece and it retained its upward angle. The finished model is 8.5 inches (22 cm) long. Even the Gothic lettering used in the name Montesa seems to be derived from an ancient civilization hidden among the foothills of the Pyrenees. In reality (as far as I know) Christian Rayer (France) and Don Smith (Britain) developed it. (Smith subsequently pioneered BMX racing in the UK.) 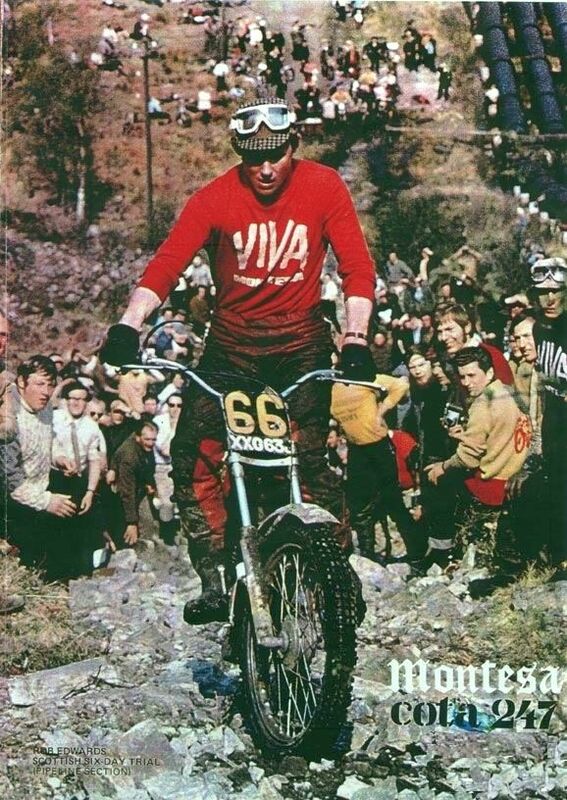 Its main rival initially was the Bultaco Sherpa (also Spanish) developed by Sammy Miller (originally from Northern Ireland) who was 11-times British champion and who practiced on a hill a few minutes’ cycle ride from where I live. 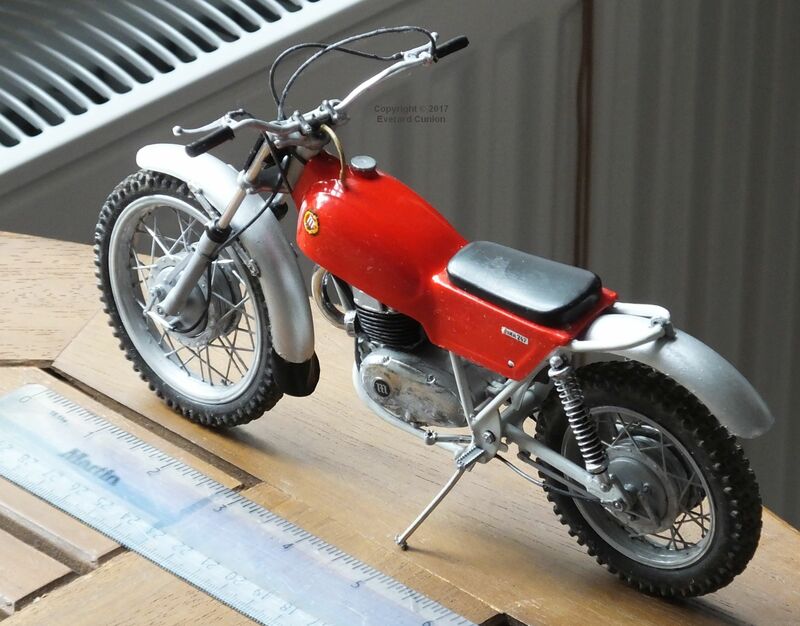 The Protar (Italy) 1/9th scale Montesa Cota 247 trials bike was made at about the same time as the prototype or first production version of the real thing, which is to say in about 1968. This is no ordinary plastic kit. Despite its age, it ranks as an engineering masterpiece. For example, the steering head and wheel axles, although made of plastic (some later motorcycle kits have such items in metal) they screw into place. The plastic is strong enough to take the torque that I sometimes found necessary to apply with pliers to finish the screwing in. 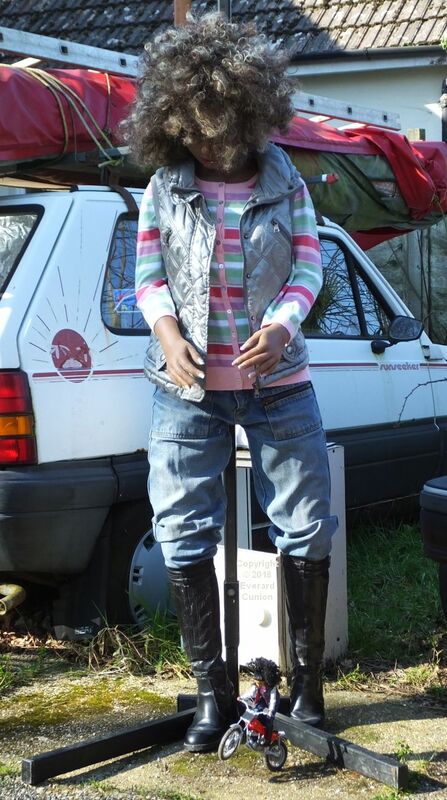 The flexible plastic chain works (after a fashion). That is, when the rear wheel turns, the chain rotates and turns a sprocket hidden under the engine cover. Even the suspension works! The kit consists of black, silver-grey, and chrome plated runners of conventional polystyrene of excellent quality. Another runner is black vinyl or a similar flexible material. It has a red tank-seat unit (more about which farther on), four metal springs, and the tyres are either rubber or vinyl (not sure). 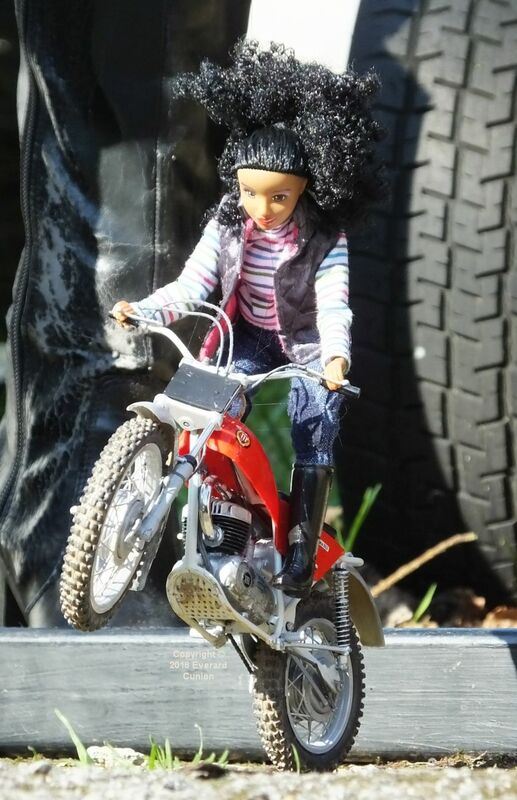 Rather than being solid, like the rubber tyres of my 1/12th scale moto-cross bikes, they are hollow moulded like real tyres. I do not, as a rule, enjoy building plastic models. I endure that messy, arduous, and time-consuming task so I can have a good model to look at and photograph. However, this kit is an exception. Even its unmade parts look good. Every step reveals the effort and skill that Protar put into it, in contrast to the cost-cutting ‘fake it’ approach used almost everywhere nowadays, understandable though the latter approach might be. It is a lot of work, but quite suddenly, when I felt I had maybe another day’s work to do, I realized I had only a couple more things to attach. Then it was finished! The tank-seat unit appears to be fibreglass or similar (like the real thing). 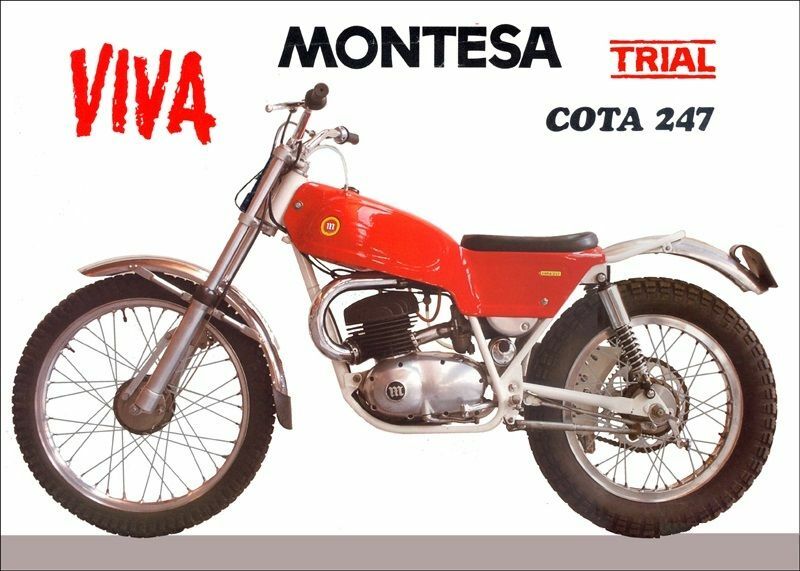 It is Montesa red, so you do not need to paint it to change its colour. A second reason why I normally paint models, even when the plastic is already the right colour, is to correct for the translucency of polystyrene. However, this kit’s tank-seat unit is colour dense and shiny, so I did not paint it. Because the tank-seat unit is not polystyrene, I used superglue to attach the black seat pad to it, which I first cut down to make it less deep. It is a snug fit on the frame, but I used some Bostik to help secure the tank-seat unit to the frame. I used conventional kit polystyrene cement everywhere else. Scrape away the chrome, where required, so that the glue has plastic to stick to. Cut off the little lugs sticking up from where the rear frame loop starts (one is just above the end of the exhaust pipe in this photo) so the tank-seat unit sits on the frame properly. The footrests, left and right, are different. One has a lug (don’t assume it is part of the runner and cut it off by mistake – I nearly did) and the other has a hole. Add the rear mudguard to the frame before inserting the rear wheel. There are two unused axles on the runner #4 (black polystyrene). They do not have accompanying part numbers. 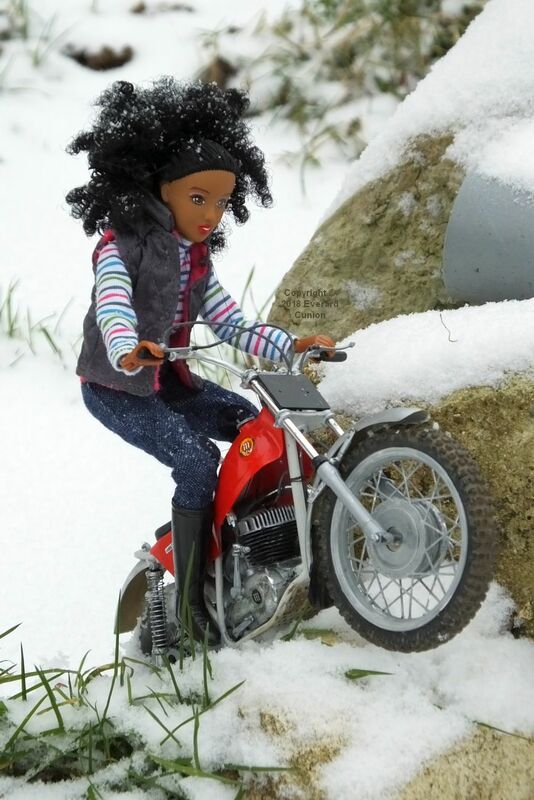 When you are this small, even a light covering of snow is a big deal! I added the fuel tank vent pipe using one of the several unused lines supplied with the kit. (Early versions, on which this kit is based, did not have them.) I secured it with a pin I pushed through the red fibreglass, which cracked it, fortunately almost imperceptibly. I should have drilled a tiny hole first. I painted the frame in Revell enamel SM 371 satin light grey, which, although an unusual choice for a motorcycle frame, is pretty much the colour of the real thing as I remember it. Other colours I used include acrylic aluminium, enamel steel, enamel polished aluminium, and the new Humbrol enamel ‘metallic aluminium.’ (What is non-metallic aluminium?) For the tyres, I tried various things, but the final layer is Humbrol acrylic 110 ‘natural wood’ brushed in thoroughly to get it between the knobbles, which I then rubbed off the knobbles with a rag. The decals (transfers) are dry-rub type. (Many are included, but I used only those applied to the real thing at the factory.) Follow the instructions, which are provided in several languages including moderately good English. You cut out the one you want from the sheet and peel of its backing paper. You then have a translucent film of plastic with the decal printed on the back. Press that onto the plastic, position it, and rub it to get the decal to adhere. Then peel off the plastic film. Unfortunately, as often as not, the decal adheres to the plastic film rather than the tank seat unit. I used a thumbnail to encourage the decal away from the film at its edge (tricky because these are small things) and all was more-or-less OK. I painted over the green in the tank logo decals with yellow, which matches the colour on production bikes. (Note: You cannot do that before applying the decals because they are underneath the peel-off layer.) I then added a coat of gloss varnish over the decals because, firstly, the paint I used to alter them was matt. Secondly, their dry-rub adherence to the plastic seems iffy to me. The varnish helps secure the decals in place. Incidentally, in this photo, you might be able to discern the thin thread I used to get Tessa to adopt a trials riding pose rather than her natural horse riding pose. Also evident is the reshaping of the handlebar I found necessary. Some of these faults might not be faults at all. I aimed to make mine as close as possible to the production version of about 1970. (As a schoolboy on a bicycle at that time, I watched trials competitions at Matchams Park in Hampshire, in the woods surrounding the motocross track.) However, the kit is based on an early production model. 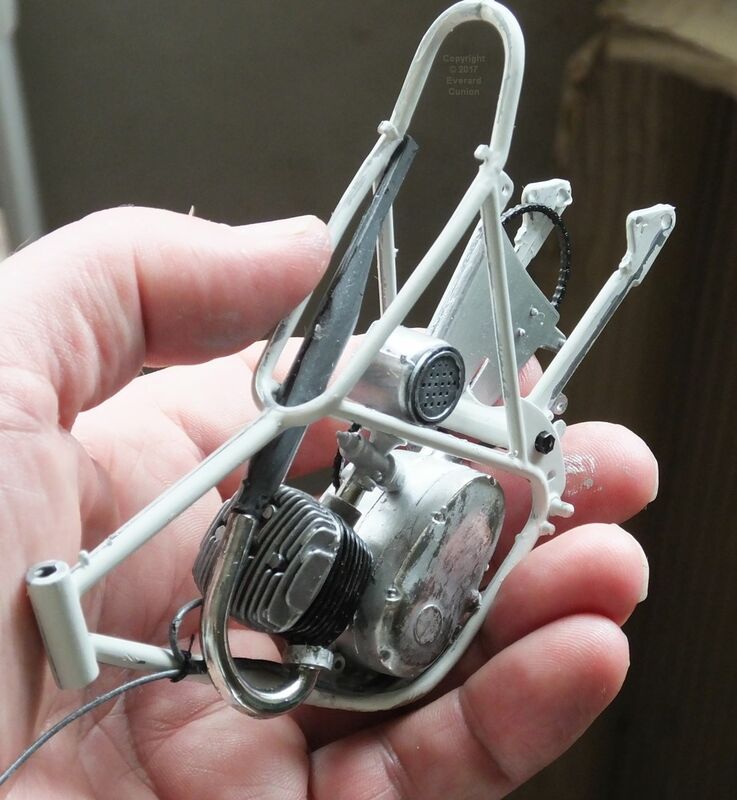 In any case, an experienced modeller won’t have a problem with these minor drawbacks and an inexperienced (but patient and careful) modeller can create an attractive model, even without painting it. It has moto-cross tyres instead of trials tyres. 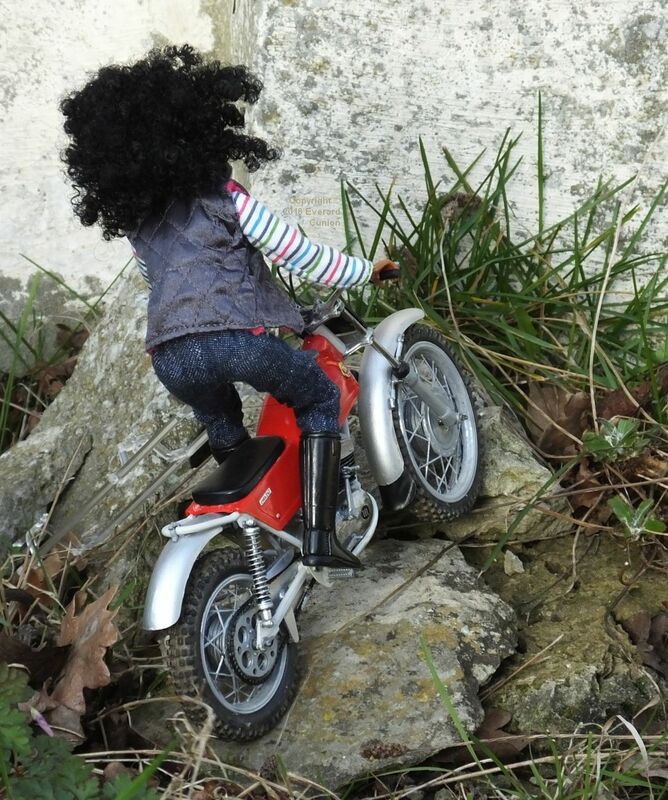 The Revell 1/12th scale Husqvarna moto-cross bike (see mine) has the opposite problem. It is a different scale from the Montesa, so you cannot swap tyres between these kits, unfortunately. The Protar Montesa tyres have a shiny finish that eventually succumbed to paint and fine sandpaper. The front brake is much larger than on later production bikes. See Anton Jolkovski’s observation under Comment for why they changed it. The tank-seat unit is fatter than on later production bikes. Again, see Anton Jolkovski’s observation under Comment for more about that. The tiny (but conspicuous) round silver fittings in the lower corners of the red under-seat fairings are not provided in the kit. I simulated them with discs of grey with a bit of white at the top a bit of black at the bottom, as you would do in a painting (two dimensional). The black seat pad is twice as deep as it should be, but I cut it down easily. The holes in the rear sprocket do not match any photos of the real thing I have seen. I drilled some extra holes and it looks better, I think. 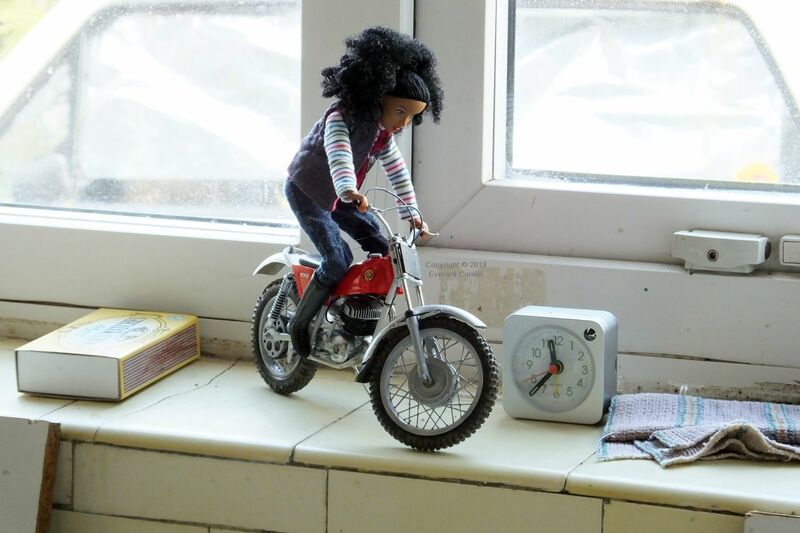 Tessa and her Montesa are at home on the kitchen window sill: A view onto the back garden and a view into a miniature world of action and beauty. 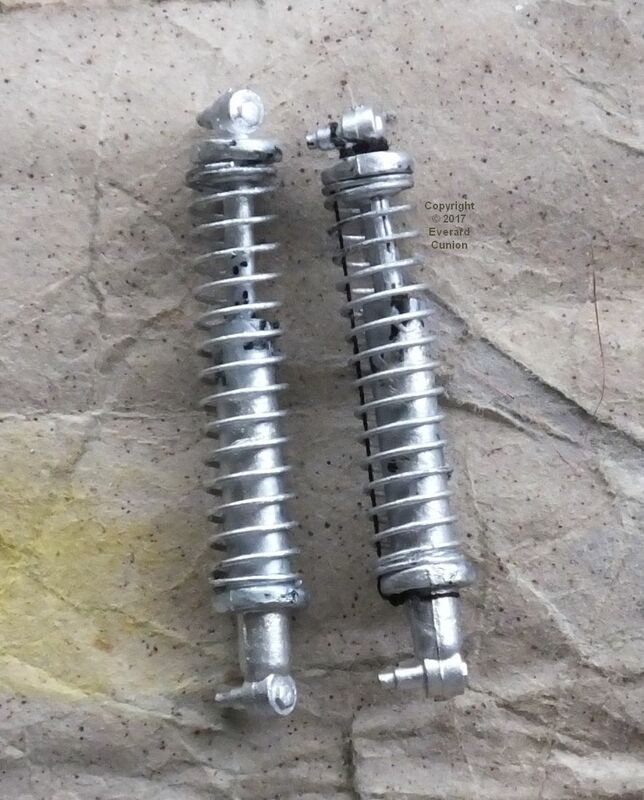 The rear shock absorbers, which use real metal springs and they actually work, are too long. That causes the rear mudguard and frame to sit too high off the rear wheel. (See photos of others’ builds on the web.) I reduced their lengths by tying thread inside the rear springs to limit their extension. (Therefore, they are pre-compressed.) The thin thread is barely visible. In the photo, the shock absorber on the left is in its standard configuration (assembled, but not glued). The one on the right has a length of thread running inside the spring and tied at top and bottom to shorten it. The springs are made of a dark metal, so I painted them silver to look more like the real thing. The rear shock absorbers on most production bikes had short polished cylindrical tops that covered the upper third of the spring. No such is provided with the kit. 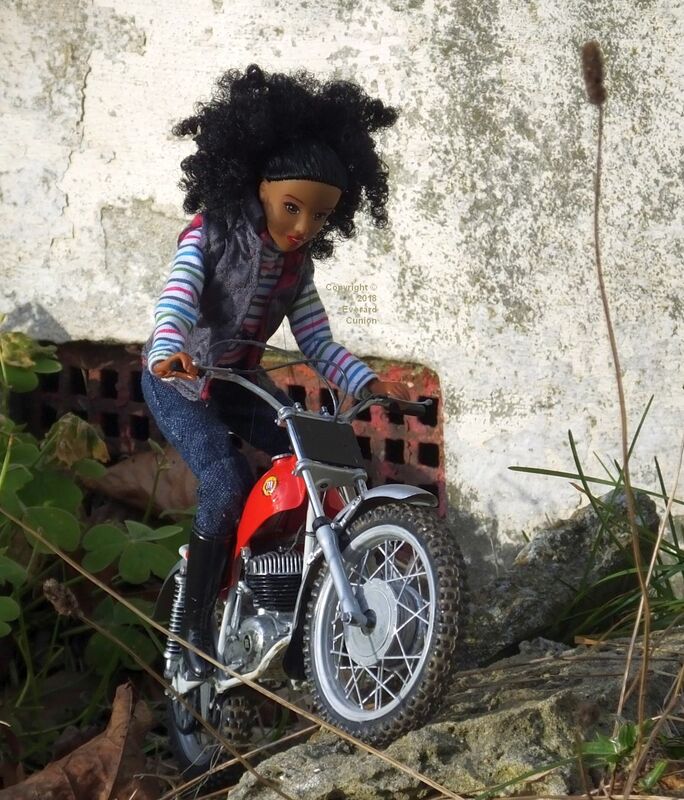 However, it appears that not all bikes had them, so my inability to find a way of replicating them is no great detriment to the finished model, in my opinion. The handlebar (chrome-plated plastic) is too tall and raked back to much. I poured boiling water over the first of the four bends to soften the plastic (more water poured for longer than I imagined would be necessary) and changed its angle. I then did the same with the three other bends in turn. The result is not perfect, but it is better than the original. Every day is a big hair day for Tessa. The chrome plating on the engine casing is so thin that the plastic showed through. It imparted a dull greenish hue to the chrome. Fortunately, the metal on the real thing was not normally polished, so that area of the model needs to be painted anyway. I aimed for an ‘almost new’ look to the bike, so, where the chrome plating was thick enough, I left it unpainted. The result is a mottled shiny/dull effect. Equally fortunately, where I wanted to retain the polished metal appearance – the fork uppers and exhaust pipe – the chrome plating is adequately thick. As mentioned, the decals are dry-rub rather than the normal type (that you soak in water and slide off the backing paper) and I found them difficult to apply. The green in the Montesa logos on the fuel tank might have been appropriate to a prototype (I have never seen any that colour) but, for a production bike, you need to paint yellow over the green on these tiny things. The image on the box is a photo of a finished kit. As far as I can discern, it is entirely unpainted, yet it still looks good because the parts are moulded in appropriately coloured (and plated) plastic of at least four types. That photo shows less accurate wheel rims than those actually included and the front suspension has collapsed somehow! (I do not understand how, given the way it is constructed.) Colour photography and printing in those days were not as easy as nowadays. I imagine that, by the time they spotted that problem, it was not economical to do it all again. 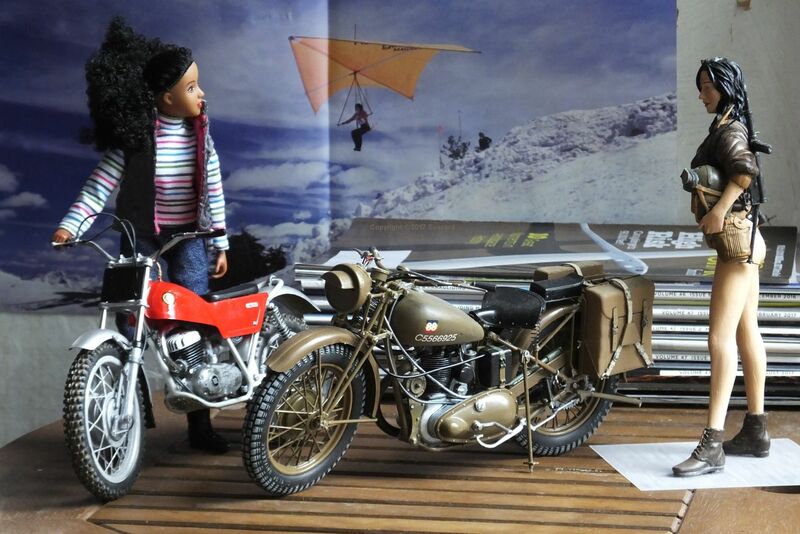 A model bike needs a rider or at least an accompanying human figure to provide a sense of scale, in my opinion. Tessa is a Breyer Nadia 1/9th scale horse rider doll. 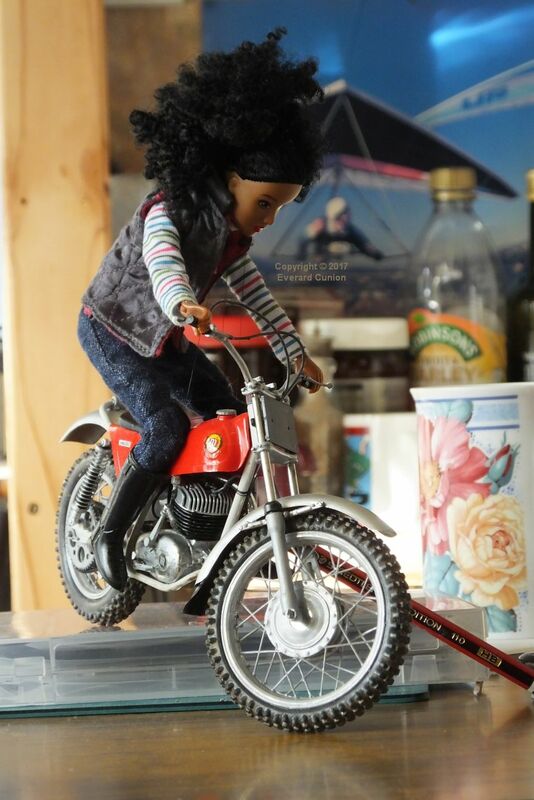 I used heat rising from a soldering iron to help soften the plastic of her thumbs to increase the gap of her grasp, which was too narrow to hold the bike’s handgrips. Her lips were pale pink and rather thin, so I painted them with acrylic gloss red (Montesa red). Viva Protar is absolutely BRILLIANT! 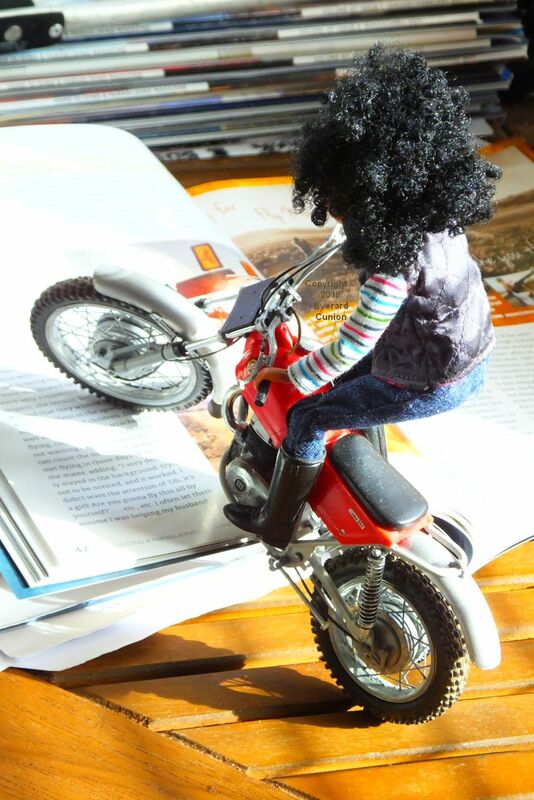 I built some Protar models in the early 70’s, but I never knew they made a model of the first trials bike I rode. 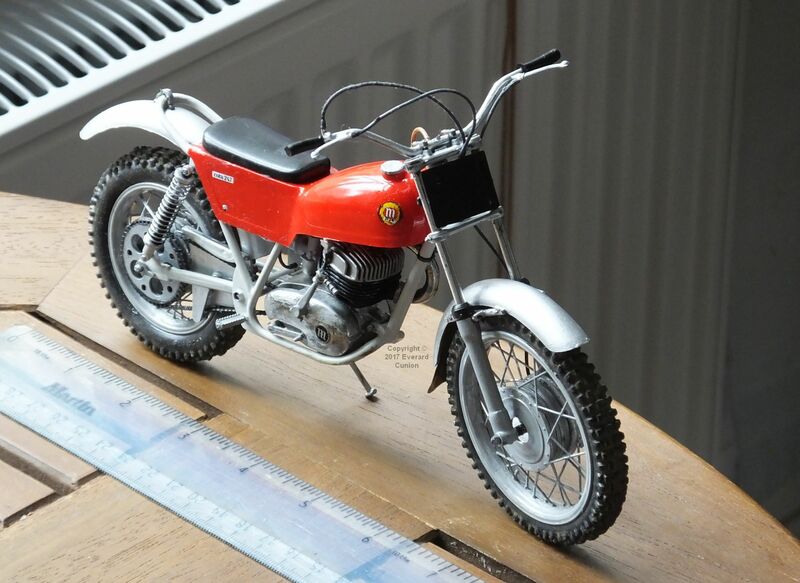 Ours was a 1968 model, bought used from Holland’s top trials rider/importer/drag racer, Henk Vink. The red fiberglass tank/seat unit was just as bulky as on the model (it was slimmed down in later years), and the front brake was just as large. The brake probably came from a motocross Montesa, and it dumped me in the mud a few times before we replaced it with a smaller, less sensitive one.